Interests: Guitar, acting, attempting to graduate from college with limited student debt and a dental plan. Interests/Where Are They Now? : Since leaving the group I've been playing around town a whole bunch with my band, and it's been taking off! We perform very regularly which is definitely surreal for me. I'm also collaborating with several producers on new tracks, and I'm currently working on my debut album which should be out by 2018! Where Are They Now? : Maya currently works in Television Development at a production company in Los Angeles. She also likes to believe she is still a current member of the ScatterTones. Where Are They Now? : A voice teacher and an aspiring Broadway star! Where Are They Now? : I live in Culver City, work at a multimedia agency for YouTube creators, and am pursuing voice acting. I've continued to study music since I graduated, now focusing on instrumental music. Interests: Browsing Michael’s Craft Stores, Hiking, Resisting the urge to eat an entire pint of Halo Top Chocolate Ice Cream, and searching for things my cat hid under my bed. Where are they now? Since graduating, I’ve been performing in musicals all over the place. When not in rehearsal, I work at a dance studio in Santa Monica and come home to my lovely ScatterRoomie (Taylor DiBernardo) and our adorably crazy cat Lollipop. Where Are They Now? : Ross works for Hulu in Santa Monica as a content finance and data analyst. He is currently taking husband applications. Where Are They Now? : She is currently starring as Eliza in the original Chicago production of Hamilton. She has a single "Love You I Don't" out now on iTunes/Spotify. Where Are They Now? 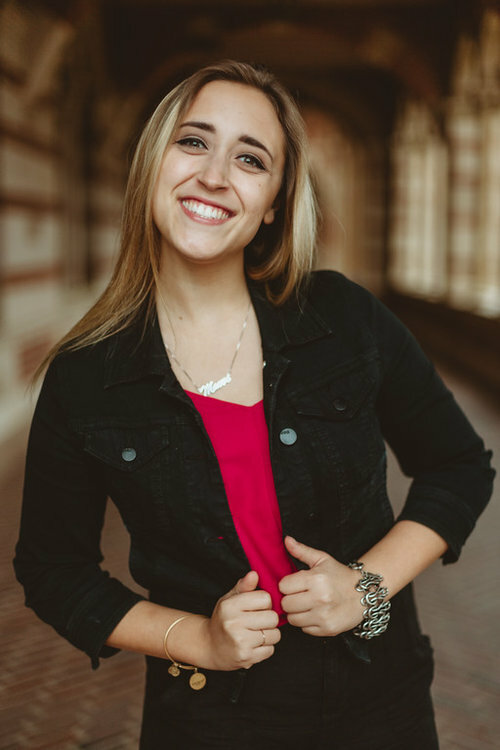 : Lauren is a middle school choir teacher in Los Gatos, CA and is working on her masters degree in choral conducting at San Jose State University. She is a soprano in the San Francisco Symphony Chorus and gets her a cappella fix by directing her students in an extra-curricular a cappella group called “Sing" founded in 2014 (they’re really cute). Lauren married her college sweetheart, Steven, in 2015. They currently live in San Jose and enjoy visiting the wine country as often as possible. Interests: Maintaining my gold status at Starbucks, perfecting Busta Rhymes raps, avoiding jury duty. What Are They Now? : Since graduating from UCLA, I've worked very consistently in musical theatre all around LA and Orange County. I moved to NYC in 2014 to continue chasing "the dream", and then spent most of 2015 singing and dancing as a performer on a Royal Caribbean cruise ship! I am currently living in New York City, auditioning all the time, training to be a fitness instructor, and falling more in love with the city every day. Where Are They Now? : Since graduating, I'm a recording artist and hi-tech/media marketer. Interests: Sports, especially baseball, soccer, college football and basketball; theater; viola; running; racquetball; reading; former journalist. Where Are They Now? : I’m now a law student at the University of Iowa College of Law, in Iowa City, IA. Before this, I got a Master's degree in journalism from Boston University. Interests/Where Are They Now? : Now I'm in SF working in Marketing as a account executive. Whenever we need extras for work or singers, I try to include ScatterTones alum in our work. Interests/Where Are They Now? : Dinosaur Comics et al, working as a licensed architect in Los Angeles and raising one (at present) crazy baby with my wife. Where Are They Now? : I’m an employee benefits/tax lawyer working at a firm here in Southern California. Also I am involved in community theater and am a member of Legal Voices, an LA-based lawyer choir!